Is the information meeting mandatory? You must attend an information meeting prior to registering your child in Lux Venit Choral Academy. You do not have to attend the one that meets at your preferred location. If you cannot attend any of the meetings, please contact the director to schedule an appointment to get the needed information. What are some payment options? When you pay your tuition at the first class/rehearsal of the month, you can use cash or a personal check. If you use cash, please place it in an envelope with your family’s name on it. 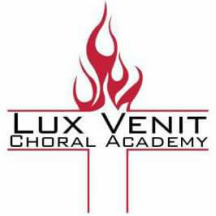 Make a check out to Lux Venit Choral Academy. What does the supply fee go toward? The supply fee is used for music, paper and printing costs, name tags, students’ rewards and any teaching aids the director requires. Is there any discount for referrals? For each referral that enrolls in Lux Venit, your family will receive a $25 discount towards one month’s tuition. Be sure the referred family indicates your name on their registration form. Is there a multiple-child discount? While there is not a multiple-child discount per se, your family will pay no more than $85 a month once enrolled, for tuition-only. What if I need to drop out? If for some reason you must drop out of your class(es), please let the director know as soon as possible. If it is near the beginning of the month and your tuition is up to date, your prorated tuition may be refunded. Can I pay more than one month at a time? Absolutely! Please write how many months you are paying for on your cash envelope or check. What kind of songs will you be singing?The selection of choral literature aims to glorify God in worship as well as expose students to a variety of musical genres such as Baroque, Classical, Renaissance, folk tunes, hymns, spirituals, etc. We will sing both sacred and secular selections from a variety of languages. The younger students will be singing quality choral literature, both sacred and secular. Is there an audition process to get into the choir? No. Students do not need to have any prior music or singing experience to enroll in Lux Venit. Chorale is an auditioned group of 9th - 12th graders. Can we bring food on to the church campus? Food and drink must be kept in the designated areas or outside the church. Please clean up any spills and dispose of trash properly. Help us be respectful of the churches that are allowing us to use their facilities. Is there a place at the church where our family can wait during classes? There will be designated areas for parents and siblings to wait during classes. These will be identified during your location’s information meeting. Will there be a dress code or uniform? For classes, skirts/dresses should be below the knee and shorts should come just above the knee or below. Spaghetti straps or tank tops are not allowed, and girls’ shirts should not be low-cut. Shirts should not have any inappropriate words or pictures. There will be a uniform for performances and concerts. All students will wear a white Lux Venit polo shirt with either black pants or skirts that come below the knees. Girls wear black flats and boys wear black loafers. What if I have to miss rehearsal? If your student(s) need to miss a class or rehearsal, please let the director know as soon as possible. You can send a message through the website or Facebook page, or email him directly up to the morning of class. If it is close to class time, you can send him a text message. How many rehearsals can I miss? Please see our Attendance Policy here. Can I join mid-year? New students may enroll and begin attending after each concert. New middle and high school students will take a beginners class for 2 months. Are there any volunteer opportunities for parents? YES! We need parents to take roll in classes, head up shirt orders/distribution, make copies, make nametags, gather homework, lead a sectional, play piano, tally merit points, etc. For a complete list of volunteer opportunities, see our "Policies" page under "Parent Volunteers". What supplies are needed? Your child will need his music, a one inch black three-ring binder, mechanical pencils, and colored pencils (Crayola Twistables are preferred.). These need to be brought every week to class. They may also bring a water bottle if desired. What kind of homework will there be and why? There will be music theory homework to help reinforce choral concepts taught in class for 3rd grade and up. This will be limited to 30 minutes a week. For more details, see our “Homework Policy” in the handbook. Can I drop my students off or do I need to stay on campus? We would prefer for you to stay on campus if your child is in the K - 2nd grade class. If you have 3rd - 12th graders, please use your discretion on whether they are responsible enough to be dropped off. Please pick up students promptly after class and do not leave students unattended when not in class. A parent must be with a student who is waiting for his/her class or waiting for a sibling's class to end. Students need to wait inside the building until a parent picks them up. Mr. Carr will be teaching his next class, so he will not be able to watch students waiting to be picked up.